Due to further development of the shearography-measurement technique with improvements regarding handling and insensivity against disturbing environmental factors, it is now possible to use shearography with a stationary measurement set-up for quality control in production, as well as for in-service-testing with a robust mobile measuring system. The use of the patented spatial phase shift technique (1) - with which for each measurement only two video images are required, and with which no mechanic phase shift unit is needed as with the temporal phase shift technique- results in a considerably higher robustness of the measuring system. In addition, the use of laser diodes for the object illumination leads to advantages in size and handling of the shearography system. The reliability of the shearography system is proven by practical measurements ( see figures 4, 5, 6, 9 ). Shearography has become an effective measurement technique for full field, non-destructive inspection of CFRP components. Shearography is a contactless, image producing measurement procedure which is very suitable for non destructive testing of lightweight structures. Compared to testing methods like Ultrasonic testing, X-Ray measurement or the Eddy Current method shearography has the advantages of full field measurement and requires accessibility from only one sides of the specimen. Shearography is an interferometric measurement technique. The shearing optics is completely integrated into a compact measurement head. Shearography is in principle insensitive against whole body deformations which results in a high resistance against disturbing factors. With the CCD-camera technique no photo laboratory is required. This makes it possible to practically use shearography as a means of non-destructive testing in InService-Inspection. The progress and development in computer technique and digital image processing have further improved the practical suitability of shearography. The development of the spatial phase shift with which for each object state only one video image has to be recorded leads to a simpler measurement set-up and a faster image acquisition. This results in improved robustness and longer lifetime of the measuring system since a mechanical phase shift module is no longer required. The actual measurement process is faster and, thus, less sensitive for disturbances. Thus, naturally, a number of problems arise which are to be worked on, and which have to be technically adapted. Depending on the application and the type of error to be found, tests have proven that strain by low pressure and thermal strain by infrared beamers are suitable. Main stress of the further development is laid on these two types of strain. Due to the required low weight and the small size, the use of efficient laser diodes is necessary for mobile use. The image processing required during measurement must be done in short time. The necessary data processing steps are to be done automatically if possible and without requiring expert knowledge. The data has to be prepared in such a way that reliable error detection is possible. In practice, the components to be tested show very different reflection characteristics of the surface The measuring system has to allow measurements even with reflecting or colored surfaces. 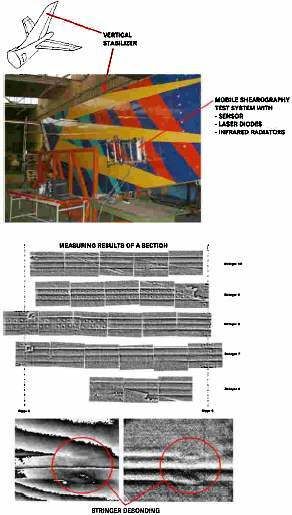 The shearography is an interferometric method with which it is possible to detect component deformation respectively the gradient of the deformation created by mechanical strain. The process is very sensitive due to the interferometric measurement principle: deformations in the range of few micrometers can be detected. The measurement sample is illuminated by laser light. With a CCD-camera, the object is supervised. 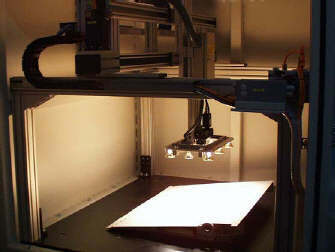 For the reproduction of the object on the CCD target of the camera (image plane), the so-called shear optics is applied. It reproduces the object on the CCD target twice: this is called image shearing. A point of the object is shown on two positions in the image plane. In other words: two neighboring object points are displayed one over the other in the image plane ( see figure 1 ). Fig 1: Principle Set-Up of a Shearography Measurement. When the specimen deforms under strain, the intensity of the laser light reflected by the object changes. Superposition of the picture of two neighboring object points on the CCD target makes it possible to determine the difference of the deformation of all object points. Evaluating the intensity measured by the CCD target in each image point does this. Thus, with shearography the gradient of the deformation of the measured object in shearing direction can be measured. Due to the latest development of efficient laser diodes that are suitable for interferometry, the illumination of the components with laser light is much simpler. A homogeneous illumination of the measurement area can be realized with an array of laser diodes. Since laser diodes are quite small and easy to handle, maximum practical use is guaranteed. During measurement, an image of the object which is not under load is recorded and stored. Then, the object to be measured is put under strain. In this condition, a second image of the object is recorded and stored. By subtraction of these two images areas of the object will be clearly visible where the surface is deformed. This can be watched in real time while the component is put under strain. Faulty areas show a specific deformation pattern in contrast to areas without defects. As a means of strain, heat and pressure differences are especially suitable. An object is put under heat excitation with heating lamps. Even if the surface is only heated up by few Kelvin, the material deforms in such a way that this can be measured with shearography. Faulty parts of a component which lead to an inhomogeneous mechanical stiffness can be seen in the deformation image as inhomogeneous. For low-pressure strain, the sample to be measured is placed inside a pressure chamber. Closed component faults, e.g., faults which are separated air tightly from the surrounding parts lead to deformations due to pressure difference. Even slight pressure difference in the range of a few ten millibar is enough to make the faults visible. During one shearographic measurement with spatial phase shift two video images are recorded and stored: one video image of the object free from strain, and one video image when the object is put under strain. Using this patented technique (1), the measurement result can be completely calculated with only two video images. The advantage is that no additional phase shift unit (piezo actor) is required, and the measurement can be done very quickly and, thus, quite disturbance-insensitively. Compare: for the temporal phase shift technique at least six video images have to be captured, 3 images for each object state. The intensity of the light at each camera pixel is determined by interference of two light beams. The following formula (1) descibes interference of two light beams. I is the resulting intensity on the CCD target depending on the intensities IA and IB of the two light beams coming from neighbored object points. f is the phase difference of the two light waves that interfere and this is the interesting value. The modulated phase value at each camera pixel which contains information about the deformation of the object is calculated from the intensity values of three neighboring pixels according to the phase shift equation (2). The spatial phase shift is realized via an optical element in the path of rays so that the phase value of the light impinging on the horizontally neighboring pixel deviates by a defined phase value (e.g., 120°). The necessary information for the calculation of a phase image is, thus, available in one video image. Fig 2: Spatial Phase Shift Technique. This phase calculation is done for the image of the object under no strain and under strain. The two results are subtracted from each other which leads to the so-called phase difference image which contains all the information about the deformation of the component, and component faults are already visible quite well. 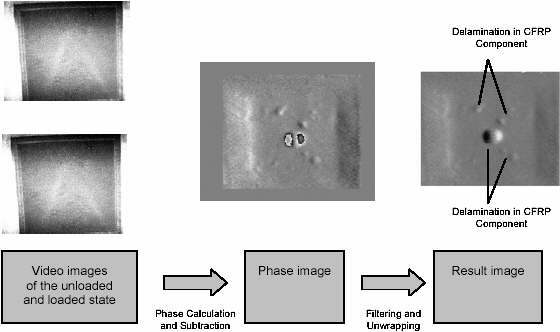 With filtering the phase image and subsequent demodulation, a steady result image can be calculated. The display of the measurement result with false color Look-Up-Tables makes the evaluation of the measurement results even easier. Due to the fact that shearography allows the measurement of complete areas, large component areas can be measured in short time. Thus, shearography is the optimal technique for fault detection. Fig 4: Shearography Measurement Result of a detached Coating (thermal load). Fig 5: Shearography Measurement Result of a Delamination with a diameter of 80 mm and 110 mm. In the measurement system set up fields of view up to 50 cm x 50 cm are realized. The working distance, i.e., the distance between sensor and sample can be minimized to approximately 30 cm by using special optical lenses. 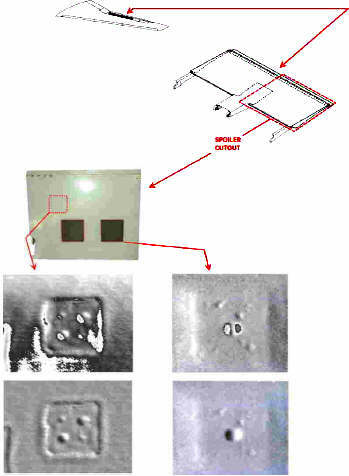 The use of laser diodes (with the advantage that they are very compact) for component illumination makes is possible to illuminate the field of view homogeneously. Thus, shearography can be used in a mobile measurement system for the InService testing. But also in the production area shearography can be used for quality control in a stationary measuring set-up. With such a measuring set-up components can be measured fully automatically. Basically component faults which lead to a stiffness change of the structure result in a characteristic deformation of the object surface under strain and can be detected with shearography. Examples of such faults are detached coatings or damaged honeycombs in sandwich structures. In monolithical structures impacts and delaminations can be detected with shearography. Not only faults close to the surface but also deeper lying fault areas can be detected if the fault is large enough to lead to a sufficient deformation of the surface during strain condition. For adhesive structures, shearography can be used to check stringer connections. Stringer debondings can be detected with shearography testing quite well as a debonding of a stringer is a significant discontinuity in the structure stiffness. Fig 6: Measurements of a vertical Stabilizer with a mobile Shearography System; Stringer Debondings, Variation of the Stiffness is clearly visible. 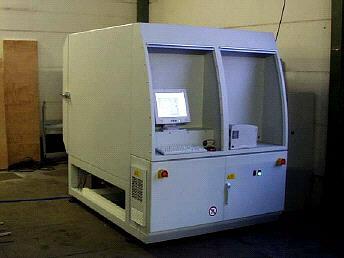 The shearography system is already used in tire testing machines for quality control in industrial conditions. A stationary shearography measurement unit has been set up within the project to check the quality of chemical fiber reinforced aircraft components after production. The system consists of a vacuum chamber which can create a measurement load of 150 mbar. Inside the vacuum chamber, the shearography system is mounted on a XY-axis system for automated positioning ( see figure 8 ), and, thus, the field of view can be moved on the object to be measured. Apart from creating low pressure, it is also possible to put the sample under thermal load. For this purpose, heating lamps with a combined power of 900 watt are integrated. The system allows a combined strain of the object with pressure and heat which leads to optimal fault detection. The field of view which can be covered with one measurement is approximately 0.25 m2. The time required for measuring, sensor positioning, measurement strain generation, data acquisition, and data evaluation is approximately 20 seconds. The section-wise measurement of large-size components in the measuring set-up is very fast and fully automatical. Fig 7: Shearography Measurement System Front with Operator's Desk. Fig 8: Low Pressure Chamber; Shearography Measurement Head on XY-Axis- System. The further development of the shearography measurement technique in the last years made it possible to apply shearography in the industrial environment as a means of testing for non-destructive testing of materials. Especially for the aircraft manufacturing shearography is a suitable testing method with which large component surfaces can be tested in short time. This applies for the use in the production process as well as for the InService-testing. The development work described in this paper is done within the MaTech research program ( project number 03N3082 ) which is supported by the German Federal Ministry of Education and Research. H. Steinbichler, Patent 0 419 936 B1, "Verfahren und Vorrichtung zur Phasenmessung von Strahlung, insbesondere Lichtstrahlung"